31st July 2010 will see the launch of a limited edition piece of Royal Naval history, the very last remaining stocks of Royal Naval rum from 1970. On July 31st 1970 a 300 year old Royal Naval tradition ended at precisely 6 bells in the forenoon watch, when the last rum ration was issued aboard ships of the British Royal Navy, a day to be forever known as Black Tot Day. 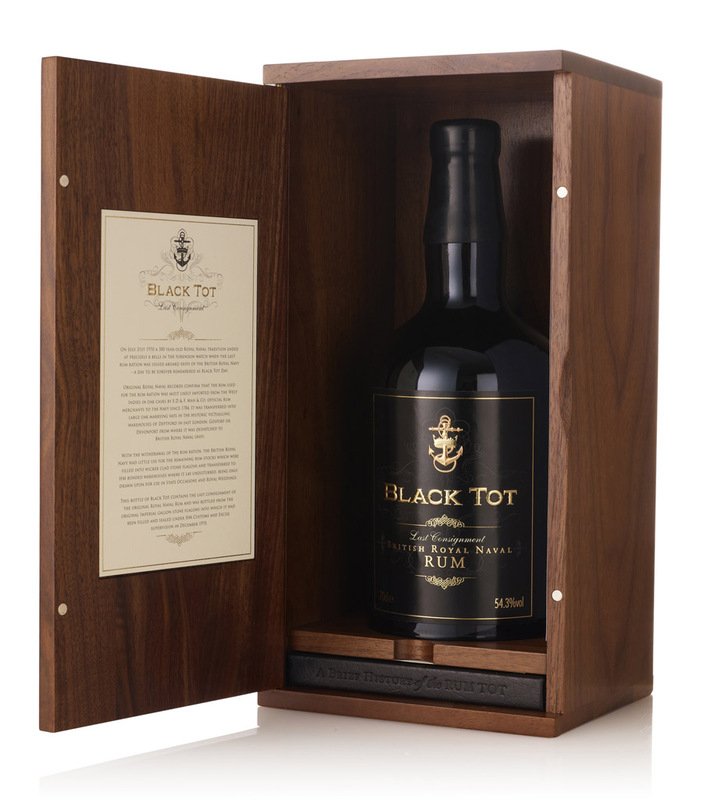 To celebrate 40 years since the last rum ration was issued to the British Royal Navy, the very same rum that has been stored away since 1970, is being re-launched under the name Black Tot - Last Consignment. Black Tot – Last Consignment is a unique rum that represents over 300 years of Royal Naval Tradition. It is effectively, a piece of history. Since 1970 the rum has sat silently in ceramic flagons in bonded warehouses, and was only brought out for State occasions and Royal weddings. The flagons have been brought together from all different locations for the first release of the last consignment. The first bottling is estimated to be 7,000 bottles and will now be available to buy as collectors items, or simply to savour. 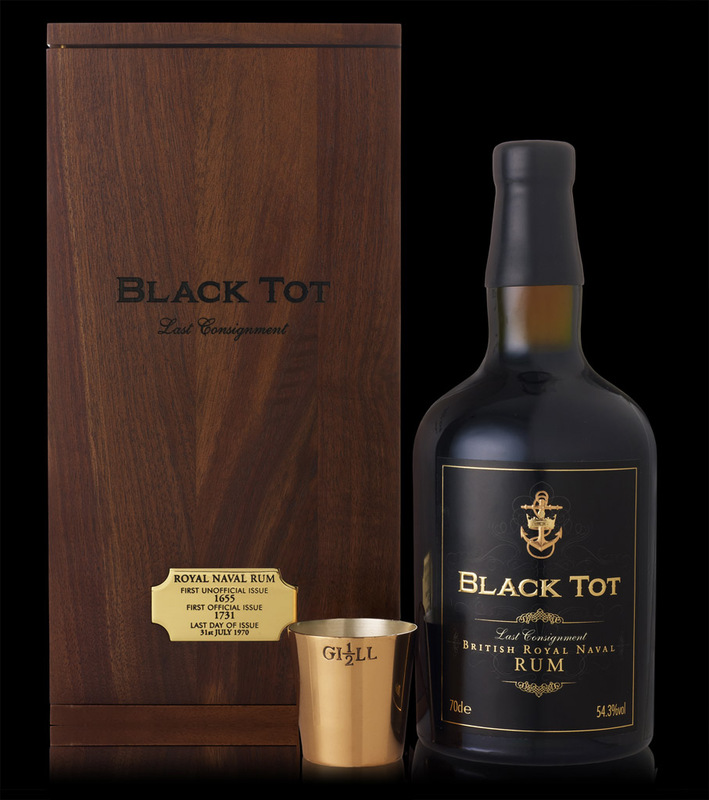 The name ‘Black Tot’ stems from July 31st 1970 when a 300 year-old Royal Naval tradition ended at precisely 6 bells in the forenoon watch (11am) when the last rum ration was issued aboard ships of the British Royal Navy – a day to be forever remembered as Black Tot Day. Forty years on and, as a mark of respect to this wonderful tradition, Speciality Drinks have decided to release the last remaining Royal Naval rum stocks from 1970. This last consignment of the original rum has been bottled from the original imperial gallon stone flagons into which it has been filled and sealed under HM Customs & Excise supervision in December 1970. The bottles are presented beautifully in a traditional glass rum bottle and sealed with black wax. It is stored in a black walnut box with a brass plaque and a certificate of authenticity. It also comes with a tot cup, typical of those used to carry out rum rations all those years ago made of copper, and lined with silver. Limited edition Black Tot – Last Consignment rum will be officially released on the 31st July 2010 to celebrate the 40th Anniversary of Black Tot Day. It will retail for £600 per bottle. The Nose - Initial treacle notes precede dark chocolate with super-ripe black fruits, muscovado sugar adn walnuts. A drop of water releases notes of black banana, liquorice root, tamarind paste with and exotic edge of balsamic. The Strength - Remarkably, after 40 years Black Tot will be introduced at 54.3% (94.2° proof), almost exactly original issuing strength. Purchase from The Whisky Exchange. Discuss this release in the forums!